Direct Complete HA™ is the newest product addition to our supplement line. We have added to our best selling product Direct Complete™, with an additional 100mg of pure Hyaluronic Acid, per serving. This complete product is a full spectrum Joint, Hoof, Coat and Probiotic, all in one. Most Hyaluronic products contain only 20 mg per serving of HA, or the few that have more are very expensive. Direct Complete HA™ now has all four accepted joint compounds in generous quantities per serving, Hyaluronic Acid, Glucosamine HCL, Chondroitin and MSM. In addition we retained all of the ingredients like Biotin for hoof development, Probiotics for intestinal health, Flax for Omega 3 and Omega 6 fatty acids along with our blend of vitamins and minerals. 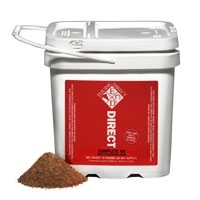 Direct Complete HA™ is the most cost effective, complete supplement on the market. Compare our guaranteed analysis, and cost to any other product on the market and you will agree!